Assisi is the shrine of Umbria’s artand spirituality: birthplace of Saint Francis and Saint Clare, its territory is still landmarked by their living memories. In our journey, we will also experience the ancient Umbrian traditions of gastronomy and handicraft. The Basilicas of Saint Claire and Saint Francis. Our trip starts from the Basilica di Santa Chiara. In one of the chapels, there is the cross originally put in the Church of San Damiano, which, according to the tradition, spoke to Saint Francis in 1205, inviting him to “repair God’s home”. The majestic Basilica di San Francesco, started in 1228, two years after the Saint’s death, the day after Pope Gregory IX proclaimed him Saint, is actually made up of two basilicas, one up on the other. The lower and most ancient one (Basilica Inferiore) is not simply a vault, but rather a superb resting place for Saint Francis’sbody. The Upper Basilica is famous for its frescoes, with stories from the Old and New Testament, by Cimabue, and from the life of Saint Francis, by Giotto. The frescoes draw a parallel between Christ’s and Saint Francis’s lives. Cimabue executed the paintings of the transept and the apse. His works are one of the first attempts to free figurative art from the rigidity of Byzantine art, later fulfilled b yhis pupil Giotto. Giotto was able to bring the divine nearer to the human, inserting the figures into a realistic space, where the characters move like Middle Ages men did into their cities: Francis is represented above all as a man, not only as a saint. Franciscan Places outside the walls. The Eremo delle Carceri can be reached both on foot (the trip is about 3 miles long)and by car, in about 20 minutes (via delleFonti del Moiano, Largo Properzio, viaUmberto I, via Santuario delle Carceri). Itwas originally a natural cave, where Saint Francis dwelled between 1205 and 1206.Today, it is enclosed in a monastery, built by Saint Bernardino of Siena in 1400, and completely surrounded by the woods of Mount Subasio. In 15 minutes, we reach the Church of San Damiano (towards via Santuario delle Carceri, viale Giovanni XXIII, viaUmberto I, via Valentin Muller, località San Rufino Campagna), where Francis first heard God’s voice and, according to the tradition, wrote his Cantico delle Creature. Few more than a mile from San Damiano, the “Sacro Tugurio” (“Holy Shack”) in Rivotorto (località San Rufino Campagna, via Frate Fuoco, via Sorella Luna, via Francesca, via della Regola) was Francis’s first shelter, and is now contained into a XIX century’s sanctuary. Our last stop is the Basilica of Santa Maria degli Angeli (via Francesca, viale Patrono d’Italia, via Los Angeles), builtin XVI and XVII century to preserve the Porziuncola, the Church which Francis restored and which became his favourite place for prayer and retirement. Here he passed on in 1226. Montelabate, Torgiano and Deruta. The Abbey of Montelabate, also knownas Santa Maria di Valdiponte (via Giuseppe Emili, SS75, Bastia Umbra, Collestrada, SS33bis verso Ravenna/Ancona, Lidarno, Ponte Felcino, Bosco, Ponte Pattoli, Casa del Diavolo, stradadel Piccione, strada Montelabate), was erected in the IX or X century, in a severe Romanesque-Gothic style. 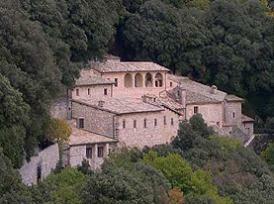 It is one of themost important sacred building in Umbria. The journey from Montelabate to Torgiano lasts about 30 minutes (strada del Piccione SP 246, Casa del Diavolo, strada Tiberina Nord, Bosco, SS 3 bis, Collestrada,il Sardo, SP 403 Torgiano - San Martinoin Campo). This small but lovely town is built upon a hill, extraordinary rich in olive groves and vineyards. Wine and olive oil are still its main produces and its most jealously guarded heritages. Deruta, 6 miles from Torgiano (SP403 verso via Mario Angeloni, E45 verso Casaccia, Pontenuovo, Deruta), hosts more than 200 factories and workshops, specialized inthe production of majolica. The traditiondates back to the Middle Ages and is documentedin a museum (Museo Regionale della Ceramica) and a library. A 12 miles’trip towards North (E45 towards PonteNuovo) brings us to Perugia.